Oct 30, 2017; Kansas City, MO, USA; Denver Broncos wide receiver Jordan Taylor (87) drops a pass during the game against the Kansas City Chiefs at Arrowhead Stadium. There is hope Broncos' receiver and punt returner Jordan Taylor will be ready by the start of training camp. 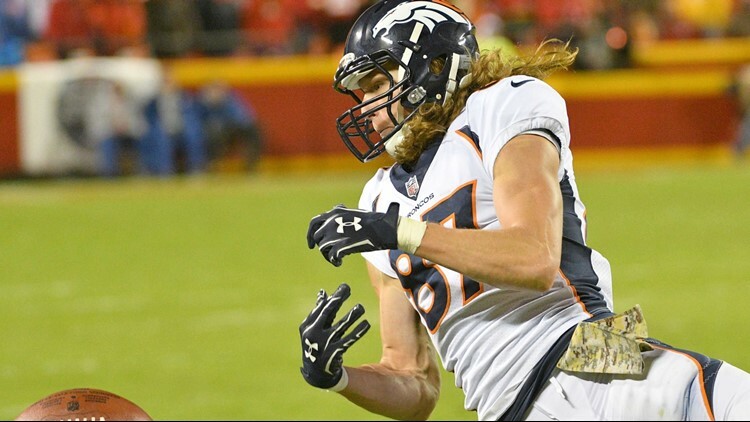 KUSA – There is hope Broncos’ receiver and punt returner Jordan Taylor will be ready by the start of training camp. He better be a quick healer. As 9NEWS reported back on January 3, Taylor was to have surgery on both hips. He had a surgery on his right hip in early January and surgery on his left hip nine weeks later. Taylor was walking with a noticeable hitch as he watched the Broncos’ first organized team activity (OTA) practice Tuesday. He was one of five Broncos players who didn’t participate. The others were newcomer veterans Jared Veldheer and Clinton McDonald, rookie tight end Troy Fumagalli and starting left guard Ron Leary. 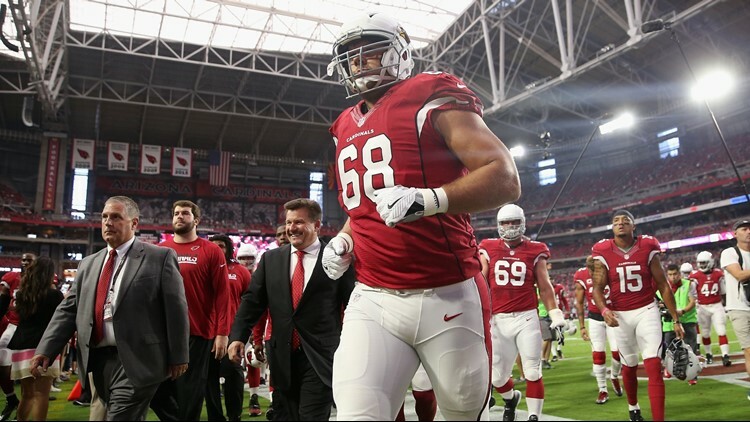 GLENDALE, AZ - SEPTEMBER 11: Tackle Jared Veldheer #68 of the Arizona Cardinals walks off the field before the NFL game against the New England Patriots at the University of Phoenix Stadium on September 11, 2016 in Glendale, Arizona. After playing defensive tackle last season for Tampa Bay with a shoulder issue, McDonald had a procedure to correct the matter in March. The Broncos were aware of McDonald’s shoulder issue when they signed him to a two-year, $7 million contract in March that guarantees him $4 million for this season. McDonald, 31, is an eight-year veteran who posted 5.0 sacks from an interior rush position last season. Fumagalli had sports hernia surgery after the Senior Bowl. All are expected to be ready by training camp, if not sooner. A mere 10 days after his harrowing vehicular accident, running back De’Angelo Henderson was cleared for full practice Tuesday. Henderson was practicing on a limited basis during his return last Thursday. Henderson said his fiancée wanted to go with him to pick up BBQ on Saturday evening, March 12. 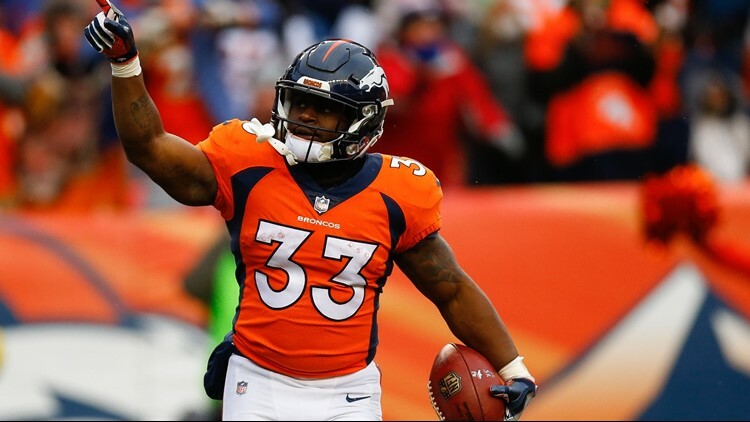 DECEMBER 31: Running back De'Angelo Henderson #33 of the Denver Broncos celebrates his first-quarter touchdown against the Kansas City Chiefs at Sports Authority Field at Mile High on December 31, 2017 in Denver, Colorado. Henderson crossing a Parker intersection on his way to picking up Dave’s Famous BBQ when his Jeep was T-boned on the passenger side by a woman driving a stolen vehicle at a high speed in hopes of evading a police chase. Henderson’s Jeep was struck with such force, it went airborne and landed on its top. In other words, it’s fortunate his fiancée stayed home. New quarterbacks coach Mike Sullivan has a neat drill. He puts up a large net with three boxed holes for targets. The holes are colored red, white and blue. Sullivan has the quarterbacks drop back, then step over bags or roll out and throw at the colored target he yells out as they’re moving. It’s a drill that combines footwork, processing and accuracy. 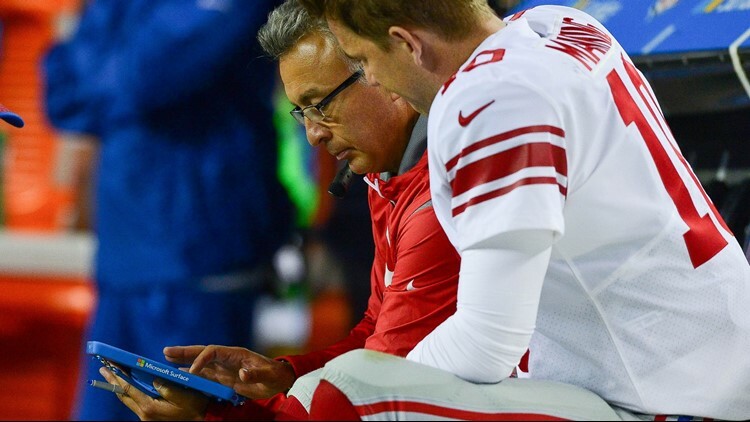 DENVER, CO - OCTOBER 15: Offensive coordinator Mike Sullivan reviews game footage on a Microsoft Surface with Eli Manning #10 during the second quarter of a game against the Denver Broncos at Sports Authority Field at Mile High. Chad Kelly was the clear winner of this drill as he drained three passes in the targets. Paxton Lynch and Nick Stevens each had one. During the 11-on-11 scrimmages, Lynch lofted a nice touch pass down the right hash mark to Isaiah McKenzie, who sped on for a long gain. Lynch also lofted a nice pass down the left sideline that rookie Courtland Sutton snagged by leaping up over cornerback Brandon Langley. Kelly also threw the ball well. *Bradley Chubb, the Broncos’ No. 5 overall draft pick, lined up on the right edge with the No. 2 defense. Shane Ray was the No. 1 outside linebacker. *Second-year returner/receiver Isaiah McKenzie caught some passes from both first-string quarterback Case Keenum and Lynch. *Third-round rookie running back Royce Freeman got a few first-team reps behind Devontae Booker and Henderson. *Offseason free-agent acquisition Tremaine Brock is clearly the Broncos’ No. 3 cornerback behind Chris Harris Jr. and Bradley Roby. *Second-year defensive lineman DeMarcus Walker lined up with the Broncos’ first-team nickel package. *Billy Turner was the first-string right tackle with Menelik Watson rotating at right guard with Connor McGovern. Max Garcia was the No. 1 left guard with Leary out. *Rookie receiver DaeSean Hamilton had a nice day and fell back as a punt returner.